What is Dr. King’s Constipation Relief? 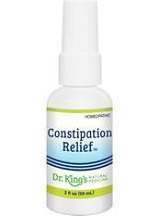 Dr. King’s Constipation Relief purports to relieve you of constipation and related problems temporarily. The manufacturer says this product can diminish such symptoms as mucus in stool, hard and dry stool, bloated bowels, stool irregularity and headaches which result from a malfunctioning gastrointestinal tract. This review will provide facts and analysis of this product to help a potential buyer decide on whether or not to purchase this product. Hold down the pump until the formula is in the pump. Then holding close to the mouth, spray the contents directly into the mouth, three times daily for adults. For children between 2 and 12 years use only two pumps daily. At the time of writing Dr. King’s Constipation Relief was retailing for $19.99. We did not come across any discounts, or volume buying promotions. After thorough research, we did not come across any negative impact resulting from the use of this treatment. However, pregnant and nursing women should consult a physician before using the product. If symptoms worsen or persist, stop using and consult a doctor. There were no customer reviews to determine if any user had complications. Keep the medication out of children’s reach. The manufacturer is confident that Constipation Relief will satisfy the buyer. As such, the product has a 90-day money-back guarantee from the date of purchase. If the remedy fails to meet your expectations, call the customer care department and they will give you a Return Goods Authorization number. However, total reimbursement is only possible for goods that have quality issues. For products returned for reasons other than quality, the customer is charged a 15% restocking fee. For people seeking regular constipation relief, Dr. King’s remedy looks like it could be worth a try. If it lives up to its billing Dr. King’s will relieve many of the symptoms associated with constipation. In addition the company is GMP certified and offers a decent, if not 100% refund policy. On the other hand, there is a lack of customer reviews. Potential clients usually buy products depending on the success stories from others. Secondly, the manufacturer does not explain what the ingredients used to make the product do. Letting people know how the active ingredients achieve the expected results is an excellent way of teaching them how the product works and instilling confidence. Thirdly, there are no discounts or promotions offered. This site is dedicated to providing you with the best information regarding constipation, its causes, characteristics, helpful hints and the best possible treatments for overcoming this challenging condition. Suffering from constipation, affects millions of people, with many experiencing symptoms at some stage in their life. Characterized by few bowel movements, trouble during bowel movements (straining), hard or small stools, bloating, stomach pain or discomfort, people who suffer from constipation, know too well the debilitating impact it can have on their lives. The causes of constipation differ between individuals as do the severity of symptoms. Whatever the cause and however it affects you, constipation can cause huge discomfort and, if not treated effectively, can lead to complications. We provide you with impartial, up-to-the-minute information regarding constipation. This condition is incredibly common, especially in today’s hectic lifestyle where stress, poor diets and eating disorders are all too commonplace. For some people, the symptoms can be mild and not last long at all, for others, the symptoms can be life changing and seem to take forever to end, if at all. Constipation suffering need not be the case. There are measures you can take to control symptoms and manage constipation effectively. We are here to help.